If your book club is . . . Kiss the flame . . . love defies family, king, religion, even death itself in a skewed Renaissance world of witch burnings, swordfights, and court intrigue. If you would like some of these beautimous (has to be one of my favorite made-up words of all time) bookmarks for your book club, please leave a comment below or e-mail me at knilsen79@yahoo.com. 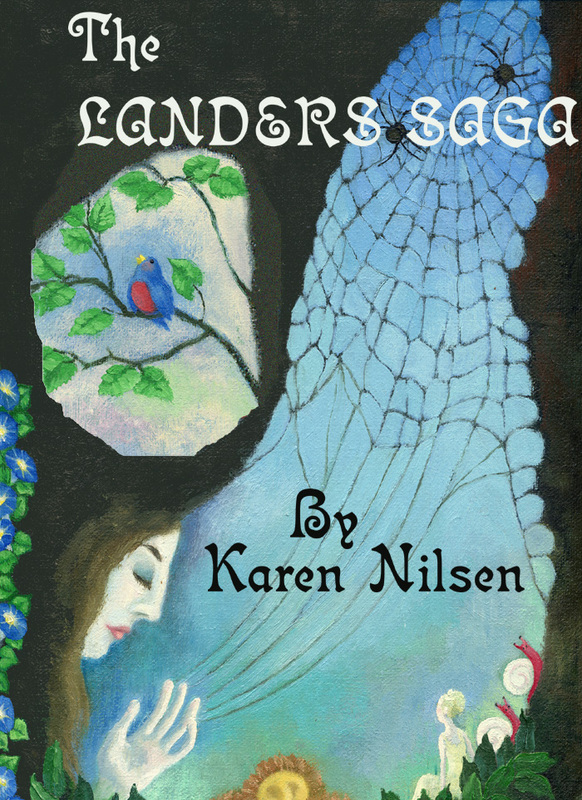 For a long time, I wasn’t going to publish an omnibus edition of the Landers Saga. However, after I finished the last book in the series, The Curious Fear of High and Lonely Places, the idea began to take shape in my mind, to the point it ended up on one of my endless to-do lists. And once it’s on a to-do list, it might take me awhile to get around to it, but it’s ultimately impossible to avoid. Hey, our to-do lists are like contracts with ourselves–once it’s in writing for me, it’s ironclad. My mother always did want me to be a lawyer. All right, back to the post. As I wrote Tapestry Lion, Phoenix Ashes, and Curious Fear, this incredible momentum took hold of me. One of my biggest worries (and this is going to sound rather morbid, but that’s me, a combination of morbid and silly) was that I would die before I finished the Landers Saga. I just had to finish it. Well-meaning friends suggested that I slow down, pace myself, and some of my critique partners wondered why I didn’t turn the books into stand-alone novels or split the longer ones, like Tapestry Lion and Curious Fear, into two volumes. Although I appreciated the advice, I couldn’t take it. And here comes the silly part, silly metaphor and silly reasoning: These books are my babies–my fretful, colicky babies who cry at all hours of the night and then charm me at unexpected moments with dimpled hands and cute smiles. Although I can clean them up with editing, I can’t split them in two. Although I can dress them differently from each other with their own cover art and colors and story arcs, I can’t make the individual books stand alone, not without their siblings. They’re a family, and they belong together. So I’m excited to announce this omnibus edition, which contains The Witch Awakening, Tapestry Lion, Phoenix Ashes, and The Curious Fear of High and Lonely Places. I didn’t include the novella Fledgling Witch, even though it’s technically a prequel to the rest, mainly because I wrote it to provide background information about Safire’s adolescence, so it’s outside the main story arc of the saga. Right now, the omnibus is available in Kindle format for the great price of $9.99. I thought about charging more for it; however, due to Amazon’s awesome 70% royalty rate on e-books priced between $2.99 and $9.99, I actually earn more royalties by charging $9.99 than say, if I were to charge $12.99. I do plan to publish it at some point on Smashwords and Barnes & Noble, but I won’t be doing a print edition for the simple fact it’s too long. 🙂 Maybe someday Createspace will give me the option to do a boxed set. If you click the link below and are familiar with the individual books in the series, you’ll see the omnibus has a slightly different cover design from the individual books. I thought about putting all four book covers together to make one big one, but that was just too many colors and images jumbled together in one place. So I used an image from one of my mother’s paintings that captured the atmosphere of the entire Landers Saga for me.